Several months ago, I received a press release for a new brand, The New Black. A few days ago, I received an unexpected package at my door with most of the product line for The New Black. There were so many colors that I couldn't wait to try them. Today, I have for you one of the 5 piece sets of this line, Jewel Heist. This set includes 5 jewel-toned mini-sized polishes. As the colors do not have individual names, for this review, I'm going to refer to them by the specific color. 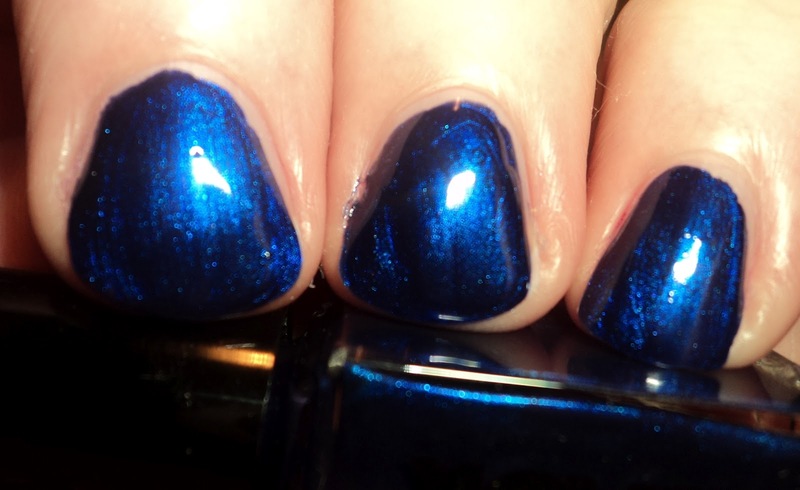 Cobalt Blue - bright blue shimmer. This one has foil ribbons running through it. Because of this, I was scared that it would be a frosty mess, but rather than being frosty, the ribbons gave this one a slight foily finish. The color on this is very saturated and rich. 2 coats. 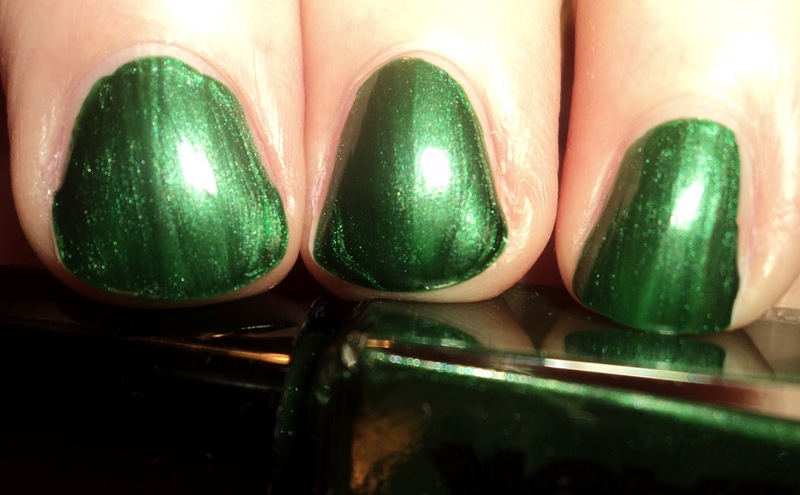 Emerald Green - Bright green shimmer with golden flecks. This one was most similar to Cobalt Blue above, as it also had the silver ribbons. However, unlike Cobalt Blue, this one did have a bit of a frosty/brushstrokey appearance. That said, it wouldn't turn me off from the polish and it's not bad, by any means. Also, this one had a fantastic formula and was a one-coater! Pearl Grey - pearly silver with a green/pink multichrome flash. You can't tell from the picture, but this one was very similar to OPI Not Like the Movies from the Katy Perry collection. Of all of the polishes in the collection, this one was my least favorite. 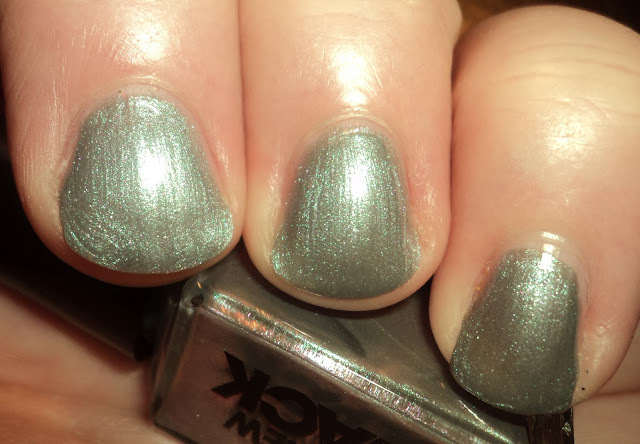 I felt, it washed out my hands and the multi-chrome, while pretty was not strong enough for my preference. This one also had the thinnest formula. Pic is 3 coats. Bright Purple - bright plummy purple creme. This one had a similar that was very similar to one of my all-time favorites, Zoya Charisma, though the color was closer to OPI's Dim Sum Plum. The formula was great on this one. 2 coats. 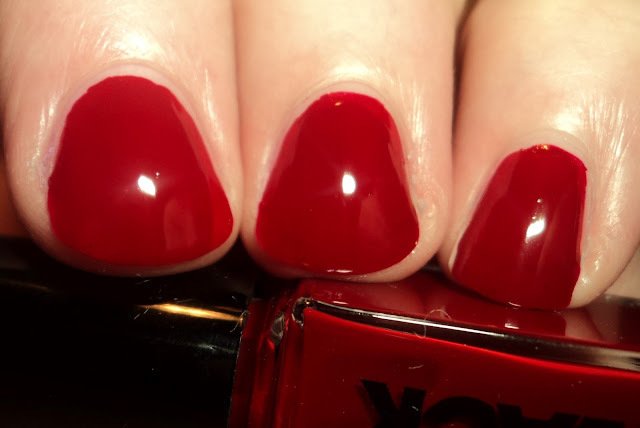 Bright Red - bright red with a jelly-ish finish. I know reds are a dime a dozen, but this one is a very nice red. The color is a little deepened when compared to other bright reds, and it leans a bit blue, so it looks nice on my skintone. The finish is a very nice squishy, opaque jelly finish. Application was one of the best in the set. 2 coats. There were several fantastic colors in this set, and all in all, I really liked it. For small bottles, I had no issues with applying the polish, and I usually do with mini bottles. You can find The New Black in several places, such as drugstore.com, HSN, and Nordstrom. The price is expensive, IMO, at $22 for 5 0.125 fl oz bottles, but that's one of the ideas behind this brand... cohesive mini collections that don't require you to buy a lot of full-size polish bottles to reach a specific look. Pretty colors. I like the red.